We get you ready for the start of spring practice for Tennessee’s football team with our position preview series. Up next is a look at the Vols’ linebackers. 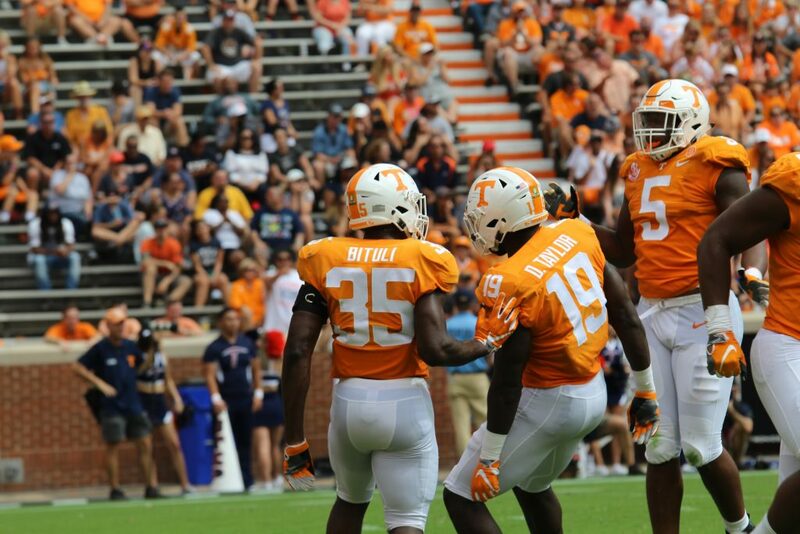 You can read our preview of the Vols’ secondary here. Tennessee’s linebacking corps figures to be very senior-heavy this year, but that might change as the season draws on. For now, this unit is a very experienced group that returns a lot of production. But the younger players in this unit could make things interesting in the fall. For the spring, the big storylines will be around the two youngest members of the linebacking group. J.J. Peterson joined the Vols very late into the year last season, finally getting on campus and officially becoming a member of the roster the week following the West Virginia game. Because of that, he didn’t really contribute as a freshman and appeared in just four games, using last year as a redshirt season. Essentially, the former four-star prospect could be viewed as an early enrollee of the 2019 class rather than a member of the 2018 class. How has Peterson taken to the offseason conditioning program at UT? How much more in-shape does he look now than when he arrived in the fall last year? Will he battle with upperclassmen for significant playing time? All of those questions will begin to be answered this spring. Incoming freshman Quavaris Crouch already looks like a college football player with how ripped and bulky he is. He’ll get his first shot at linebacker rather than running back. As a side note, it looks like Jeremy Banks will be at running back to start the spring rather than linebacker, so his position will be worth keeping an eye on moving forward. As it stands right now, Peterson and Crouch are the only “newcomers” to linebacker this spring. Crouch has played linebacker in high school, but he hasn’t played as much there as he did running back. This spring will be vital for him to learn the nuances of inside or outside linebacker, and he’ll get a leg up on fellow 2019 signees Henry To’oto’o and Roman Harrison, though it remains to be seen where those newcomers will all play in the linebacking group. Darrell Taylor elected to return for his redshirt senior season over the offseason, and assuming he puts in the necessary work, he’ll be one of the Vols’ starting outside linebackers in the fall. Daniel Bituli should be starting at inside linebacker, though it’s not out of the question that he could move positions, too. Darrin Kirkland Jr. will be interesting to watch this spring. He had flashes of his old self last season after battling back from injuries, but he wasn’t as productive as fans hoped he could’ve been. How have the last few months been for him and his recovery from his past injuries? How limited will he be this spring? It’s not like he needs a ton of reps, but he also isn’t guaranteed a starting spot. Deandre Johnson had some bright moments as a sophomore last year, but he was overall inconsistent. This spring will be big for him as he fights for a starting job at outside linebacker. Jordan Allen almost transferred off the roster this offseason, but he pulled his name out of the transfer portal and remained with the team. He and Johnson will be the frontrunners at the other outside linebacker spot opposite Darrell Taylor to start the spring. Will Ignont has a lot of potential, and he played a lot of snaps last season at inside linebacker. There’s a chance he could be a starter this fall, and he’ll need a strong spring to get ahead of Kirkland Jr. and others. Shanon Reid didn’t play a great deal, but he did see the field some. If he can put together a good spring, then he could throw a wrench into the position. Solon Page III will likely still just be a contributor on special teams, but he’ll have plenty of motivation to perform well during spring practices. Austin Smith is still in the transfer portal and will likely transfer off the roster, and Quart’e Sapp declared early for the NFL Draft and is no longer on the team. That leaves the Vols with 10 projected scholarship linebackers for the start of spring practices. Tennessee’s linebackers have a lot of returning experience, but the younger players are the highlight of the position. And with two other highly-rated freshmen joining the fray over the summer, the intrigue will only grow over the coming months.